When trading intraday breakouts, or when engaging in any type of trading for that matter, it is important for the trader to use every type of advantage possible. In all forms of trading, no matter if the vehicle is the equity, futures, or the forex market, there are many instances of false breakouts. In order to reduce the negative effects of these events, let-s take a closer look at intraday breakouts and how to trade them. Ascending and descending triangles create excellent breakout patterns, because the pattern itself establishes a directional bias for the trade. An ascending triangle is formed by a combination of diagonal support and horizontal resistance; a descending triangle is formed by a combination of diagonal resistance and horizontal support. In the case of an ascending triangle, the bulls are gaining strength and buying at higher and higher levels, while the bears are merely trying to defend an established level of resistance. In the case of a descending triangle, the bears are gaining strength and selling at lower and lower levels, while the bulls are merely trying to defend an established level of support. When trading ascending or descending triangles, the trader can gain an edge by looking to the direction of the currency pair prior to the formation of the triangle pattern. Ideally, we search for situations where the triangle and the prior trend are in agreement, directionally speaking. This is because it is not unusual for currency pair to trend, then consolidate, and then resume trending. The directional bias of a triangle is to break the horizontal support or resistance, and if the pair was trending in the same direction prior to the formation of the pattern, the trade becomes all the more compelling. 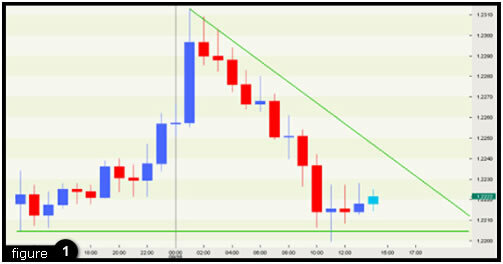 For example, on the hourly chart of the EURUSD pair, we see the formation of a descending triangle. 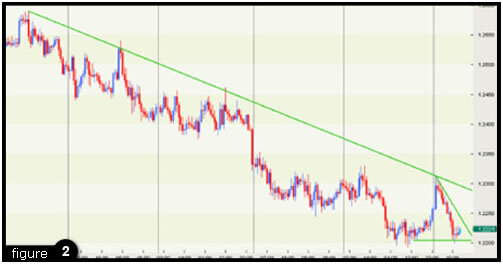 Figure 1: A descending triangle on the hourly EUR/USD chart. The first thing the trader needs to ask is, what was the trend prior to the formation of the triangle? If we take a longer view of the pair, we can see that the pair has been trending steadily lower. Figure 2: Descending triangle harmonizes with the prior downtrend. It-s important that we use the power of this trend to our advantage, to reduce the occurrence of false breakouts. As a general rule, traders should always trade with the trend, and never fight the trend. It is essentially the difference between swimming with the tide or against the tide, and traders that fight against trends often regret their actions. Another edge that we can put to use when trading intraday breakouts is the time of day. Perhaps you are familiar with the trading axiom that a breakout is considered significant if it occurs on high volume, and is considered less significant if it occurs on low volume. While forex traders are not able to easily access accurate volume figures, we do know that trading is not equally liquid at all time of the day, and there are certainly times of day that generate more volume than others. Let-s take a closer look at the forex trading day to see how we can use this to our advantage. When we-re dealing with a vast, liquid market like the Forex, it-s important to understand which times of day are the most active and most liquid. Because this market follows the sun around the world, trades take place literally all day and night. Let-s take a closer look at the Forex trading day, to gain a better understanding of the market and of its optimal trading times. The Forex trading day is considered to begin at 6:00 PM Eastern U.S. time. Because Forex trades 24 hours per day, the trading day also ends at 5:00 PM Eastern. Why is this particular time used? Consider that when it is 5:00 PM on Sunday in New York, it is monday morning in places like Australia and New Zealand. Overall, volume is low at this time of day because the three biggest Forex volume centers - Great Britain, the United States and Japan - are mostly inactive at this time. However, the Australian dollar and the New Zealand dollar (also known as the "Kiwi") may see some price activity during these hours. A few hours later, around 7:00 PM Eastern U.S. time, Japan awakens and the Forex markets begin to stir. Japan is the third largest Forex trading center, and comprises about 10% of all Forex trading volume, as many major banks have offices in Tokyo. The Japanese Yen is particularly active at this time, especially vs. the Euro, the U.S. dollar, and the Great Britain pound. Most of the volume occurs during the early part of the Japanese session, and the liquidity lessens considerably as the trading day continues. As the Japanese trading day winds down around 3:00 AM Eastern U.S. time, European markets open for business, and the London trading day begins soon afterward. Great Britain is by far the most important and influential Forex trading market in the world. The dealing desks for many of the world-s major banks are run from London, and the market is responsible for roughly 30% of all spot forex volume. London tends to be the most orderly forex market due to its tremendous liquidity. About midway through the London trading session, U.S. Forex traders come to life. New York is the second most important market in Forex trading. New York trading is very liquid and accounts for about 20% of the world-s total forex volume. Trading is especially active early in the New York session, as the London session is still ongoing. U.S. Economic news releases often occur early in the New York session, and can cause a tremendous amount of volatility. Trading often becomes choppy after midday in New York as the London market winds down, and liquidity and volatility begin to dissipate. By mid to late afternoon New York time, London traders have gone home for the day, and it is late at night in Japan. New York traders, while still active at this time of day, have already finished with the bulk of their trading. Friday afternoons in the U.S. are generally the least active, because for much of the trading world, it is already Saturday. Finally, as the U.S. markets close, a new trading day is just about to begin in the western Pacific, as the Australian and New Zealand markets begin to stir, starting the process once again. The cycle continues all week, with most dealing desks closed from Friday afternoon until Sunday afternoon, when trading resumes. Now that we have a greater understanding of the forex market-s liquidity as it relates to various times of day, let-s see how this can affect our trading. Just like an equity trader, I-ll assume that a breakout that occurs at a time of high volume is legitimate, and a breakout that occurs at a time of low volume is suspect. 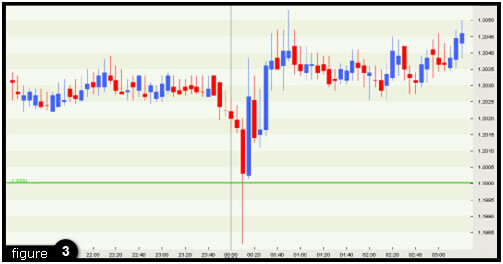 For example, let-s take a look at the daily chart of EURUSD. The pair had formed strong support in the summer of 2004 at 1.2000, which is also a number that takes on psychological significance because it is a large round number. In fact, the pair could not close below 1.2000 and then trended higher, before returning to the same area of support in the summer of 2005, when it cautiously hovered near 1.2000. Finally, during the August 24 session, the pair suddenly tries to break support. However, we can see in the five-minute chart that the break was short-lived, a classic example of a false breakout. 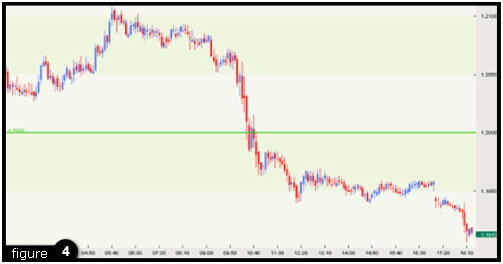 Figure 3: False breakout below support on EUR/USD. A trader who pays attention to the time of day would have noted that the break occurred late in the Japanese session, a time of day that is notorious for low volume and for false breakouts. Such a trader would have considered the timing of this event to be suspicious and would have refrained from entering a trade. Figure 4: A true breakout below support. At this time of day, the London session is ongoing, and the New York session is well underway. As a result, this is a time of high volume and the trade is more likely to succeed. The pair finally breaks 1.2000 and drifts as low as 1.1865 over the next few days. As we can see, there are steps we can take to alleviate the problem of false breakouts. These are just a few of the subtle nuances that traders use to gain an edge.